What’s the Air Conditioner Compressor? How long should air conditioner compressor last? What’s Done During an AC Compressor Replacement? 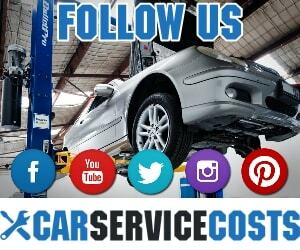 Depending on the cause of the problem, fixing a faulty AC is one of the most expensive car repairs that you can do. Most of the time, it may have something to do with the AC compressor, a central component of the AC that has several moving parts that can get defective over time. On the bright side, getting your car AC compressor fixed will probably cost less than fixing or replacing the individual components, which is why most service providers opt to replace the old unit altogether instead of trying to fix the different parts. Here you can find the average AC compressor replacement cost, how much does it cost to fix an AC compressor with parts and labor, when should you perform the replacement, what’s done during the service and comparison of AC compressor repair costs. Well, the car AC compressor cost ranges from $180 to $700, and this is just for the unit itself, whereas the cost for individual labor combined with the cost of the different parts can go up to between $350 and $750. 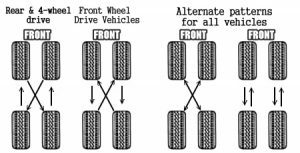 Of course, you also have to factor in the car model as well as the difficulty of the task, which varies from one unit to the other. As mentioned, the air conditioning system of a car is made up of many different moving parts, including the evaporator, the condenser, and the compressor. The compressor is a vital component of the system because it has the important job of compressing the refrigerant before passing it on to the evaporator. The compressor is also made up of many different parts, and if any of these parts fail for some reason, the compressor could stop working altogether. What happens, in this case, is that the broken components scatter about, spreading debris all around the AC system, which is why most mechanics start by replacing the orifice tube and the receiver first because that’s where most of the debris tends to accumulate. 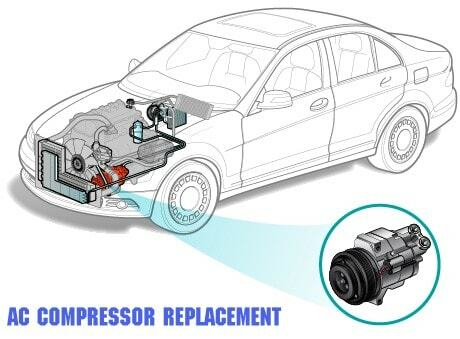 The AC compressor cannot work properly without the bearing, clutch and electrical connector, because they work in unison to turn on the air conditioning. Should any one of these parts fail, the best course of action would be to replace the compressor completely. Not only will this save you money in the long-run, but it’s also the most practical solution. The seals in the AC compressor are also quite problematic and can get easily damaged when AC oil starts to leak or similar problems occur. Unfortunately, you cannot replace these seals so if they get damaged, you have to replace the entire AC compressor. If you live in a hot climate, then you know how important it is to have a well-functioning AC system in your car. It enables you to enjoy cool air without having to open the windows and you can regulate the temperature so that it’s comfortably set to your preferences. It’s a good thing that nearly 80% of new cars come with an AC system, and when you think about it, AC compressor replacement is way more cost-efficient than enduring the searing heat in traffic or off-road without the availability of cool air. Keeping your car temperature nice and cool will also help you avoid brawls between the kids because of heat discomfort. A well-functioning AC will keep the windows and windscreen clear and mist-free, allowing you to see the road properly no matter what the weather’s like or how many people you have in the car. Having the windows up has a positive impact on your car’s aerodynamics, while it also helps reduce fuel consumption and overall noise levels. Considering an AC compressor replacement? Then you should keep in mind that there are several general signs that usually accompany a faulty or broken air conditioner compressor. The most obvious of these symptoms involve seemingly minor glitches in the AC’s functioning, which are characterized by a lack of air in the air vents. The mechanic at your local garage should be able to identify the source of the problem and can easily spot which of the components is responsible for the issue. Your engine might also make a weird clicking sound, which is often the result of dried up components that get dehydrated due to the AC being underused. The sharp clicking sound is the result of the components trying unsuccessfully to regain functionality, but it only leads to hot air and a poorly functioning AC. So make sure to take your engine in for an inspection if you ever hear weird noises coming out of it. The good news is that your compressor will alert you when something goes wrong. Typically, the most common signs come as a drop in the AC’s performance, since the compressor is in control of distributing and pressurizing the refrigerant. If the air coming out of your AC is not as cool as it used to be, then it might be a sign that there’s a problem with the compressor. A damaged compressor losses its ability to control the AC’s refrigerant flow, which then seriously compromises performance. If there are loud and unusual noises coming from your AC, then the AC compressor might be starting to fail. The compressor is built from several unique components which are turned on using a sealed bearing. Should any of these components or the bearing fail or break down, your AC compressor will likely make a few weird noises as a result. For example, you should expect to hear a squeal or a grinding noise if the bearing is being snatched by something, whereas a high pitched grinding sound or squeal could be a sign of a worn out or leaking bearing. Now, because compressors are very complicated mechanisms, it’s usually best to just replace them altogether instead of trying to repair them. A faulty clutch that won’t move is another sign that your compressor could be having problems. Without a well-functioning clutch, the pulley won’t be able to engage and disengage itself from engine power, which is what essentially allows the compressor to turn on when you need it to. Breaking cuts the compressor off from its engine power supply, whereas seizing keeps it perpetually activated. 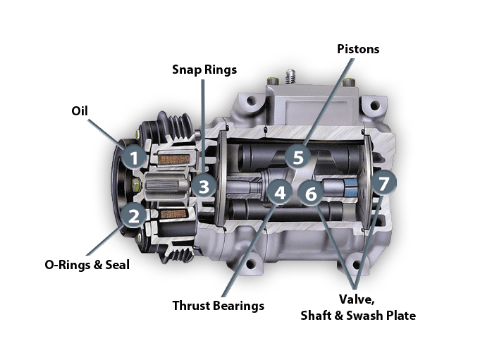 While it is possible to replace the clutch alone, the most cost-efficient option is to replace the compressor itself. The AC compressor is at the very center of your AC system’s operations, and if your AC system’s recent performance has left you feeling unsure about its condition, then you should definitely consider having it checked out by a professional technician. Once you explain to the technician that you suspect your car’s AC system is broken, he’ll start by performing a few tests that will assist him in diagnosing the problem. He’ll check the AC system for pressure, as well as power and ground. Should any malfunctions be found within the compressor, the technician will most likely recommend that you completely remove the refrigerant. Next, he’ll flush out foreign items and debris from the system by removing the orifice tube, compressor, receiver drier and expansion valve. The technician will install the new compressor, as well as a new receiver dryer and orifice tube if necessary. He will then empty and recharge the AC system, before examining it for possible leaks. Once the technician is happy with the installation, he’ll most likely check how it’s working to make sure it’s back at full functionality. Save money on AC replacement cost by purchasing the parts from an online platform like Amazon or Walmart, all of which make it really easy for anyone to access auto parts. 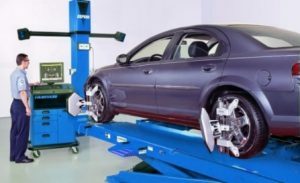 If you’re already good with your hands and are comfortable handling car parts, then you can easily perform the repairs yourself. Just make sure to do some research beforehand and you’ll save yourself a ton of money in labor costs as well. If the issue is with the AC compressor, then you should have an easy time removing it because it’s a really straightforward process. However, most amateur technicians might still struggle with a few things, like removing the refrigerant, because draining it can be quite tricky. 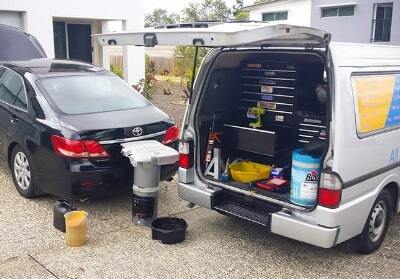 But if you don’t want to do the repairs yourself, then just get a professional mechanic to do that part for you and you should be fine for the rest of the job. Also, make sure that you know how to test the AC compressor, as you’ll have to give it a try after you’re done to make sure that it works optimally. Another way to save on the cost of the air conditioner compressor is to compare different prices and pick out one that offers the best value for money. Call different car repair shops and ask them to give you a price estimate and compare the quotes with the prior research that you’ve done on the approximate costs of the job, labor and components included. To avoid being swindled by scammers that offer low prices with little experience, do a background check on each provider to find out what type of reputation they have. You can also find service providers online by typing “how much does it cost to replace AC compressor car”, “AC compressor replacement cost” or “how much does it cost to fix car AC” on any of the online search engines. We’ve gone ahead and made a list of the average costs for labor and components, based on the most popular car models. Keep in mind that this is more of a rough estimate of what you could pay for an AC compressor replacement, and costs differ from one repair shop to the other.